impression of the 'Jaws' poster?" Daiei did a great job of updating Gamera with Gamera, Guardian of the Universe. It delivered some amazing traditional rubber-suit giant monster action, coupled with state-of-the-art special effects, knocking even the later Godzilla films off the top of the hill for realistic destruction. How could they possibly follow it up? By making a better movie. Gamera, Guardian of the Universe was a straight giant monster movie, fused with some super-hero conventions. For the second modern Gamera movie, Gamera 2: Advent of Legion, screenwriter Kazunori Ito and director Shusuke Kaneko move Gamera in a new direction, more closely following the model of a 1950 science fiction movie (which is what kaiju films started as in the first place). All of the beloved elements are there: the invasion from space, the bizarre and apparently unconnected events, the scientist who somehow has knowledge well beyond her station, the military that can't make a move without consulting said scientist, and the scramble to figure out that one thing that might kill the monster (extreme light, salt, over-feeding, rubber erasers, whatever). Okay, she doesn't have a lab coat. Can she at least grow a wimpy beard? In a pre-credit sequence we hear American voices talking about an object on a radar screen. The object is approaching earth, and the voices, which are apparently part of the Conspiracy as documented on The X-Files, decide to tell people that what's coming to earth is just an unusual meteorite shower. They cite the usual reasons of avoiding a public panic, but what reaction do they expect when huge rocks begin falling from the sky during a supposedly harmless meteor shower? On the Northern Japanese island of Hokkaido, a science center educator named Honami is leading a field trip, made up of a bunch of school children... at night... in the middle of winter. One wonders what Honami is supposed to be showing them. The thrilling effects of frostbite, perhaps? In any case, the field trip is cut short when a mysterious object flies over and crashes nearby. The next day the army cordons off the area, but even though they have a crater, they can't find the object that made it. 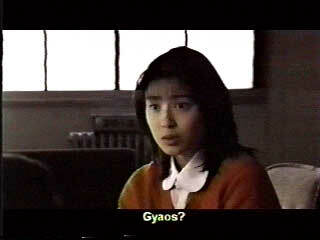 A Japan Special Defense Force (JSDF) officer named Watarase contacts Honami to get her opinion on what may be going on. To see the military consult a scientist during a crisis in not unusual in a Japanese science fiction movie. After seeing movies like Gorath, The Last Days of Planet Earth and nearly every Godzilla film, we have started to think that scientists in Japan have the God-given power to co-opt any political or military authority. 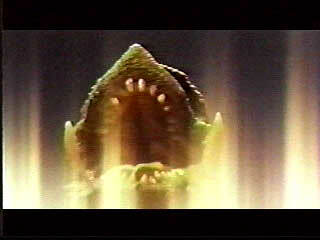 Gamera's spiky new adversary, Legion. Gamera's going to need more melted butter. In this case, however, the military is not asking the opinions of a Nobel prize-winning scientist. Honami changes the lenses on the planetarium projector and shows kids what happens when you drop a flower into liquid nitrogen -- hardly the sort of person we expect to be trusted with the fate of the world. Shouldn't she at least be wearing a white lab coat instead of a red blazer? People in lab coats save the world. People in red blazers sell real estate. Things come to a head when the insect creatures attack a subway train underneath Sapporo, and a huge plant sprouts out of the ground and through a building at the same spot. The army quarantines a large portion of Sapporo, and prepares to blow the offending plant up. However, the plant is producing tons of extra pure oxygen, so any explosion that isn't carefully set will blow up the entire city. Just when things look their worst, Gamera shows up. The flying giant turtle creature destroys the plant by sucking in the extra oxygen and expelling it as a fireball. This causes the insect creatures to swarm Gamera, gravely wounding him. This happens in every Gamera film, because Gamera can't properly save the world unless he does it while simultaneously recovering from a mortal injury. After Gamera retreats, a large insect of a new variety pops out of the ground and flies south. The military names the creatures Legion, and tries to destroy the mama Legion before it gets any farther south, but to no avail. Soon the mama Legion will have grown to city-crushing proportions. Meanwhile our heroes (who now include Honami, Watarase, and Honami's nerdy friend Obitsu, who works for the NTT Hokkaido Network Operation Center, whatever that is) figure out that the Legion insects and giant plants are symbiotic partners in a super organism that can actually move from planet to planet using huge, oxygen-fueled explosions. We've included this much plot synopsis to give you some idea of the scope of Gamera 2. The film isn't afraid to explore brave new ideas, and the process of packing these concepts into the story doesn't take nearly as long as you might think. The film meanders only occasionally, and much of the scientific speculation comes while the characters are on the run from highly destructive space aliens. Gamera flies to the rescue. Gamera 2 is a big leap forward for the special effects in a Japanese monster film. 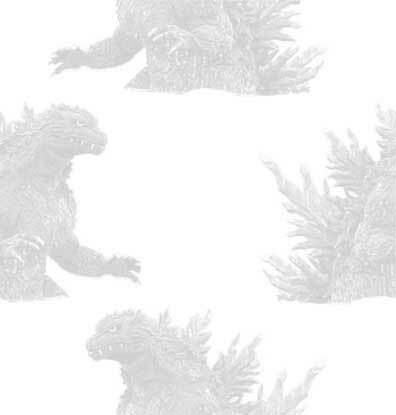 While the roughly contemporary Godzilla vs. Destoroyah had some computer generated images, they were mostly simple morphing effects. 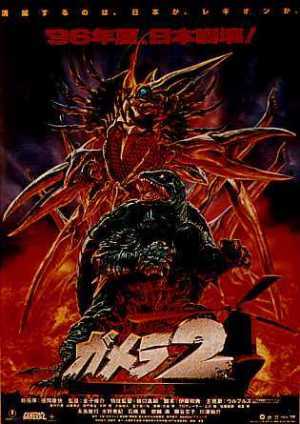 Gamera 2 features scenes with monsters that are entirely computer generated, and more importantly it features scenes that could only have been done with CGI, like the Legion swarming up from the ground to envelop a struggling Gamera. Still, most of the effects are done in the conventional manner with men in suits, but they're done well and the designs of the monsters are pleasing. Gamera 2: Advent of Legion also excels at incorporating the human characters into a monster scenario. While the military might of Japan may be largely ineffective against the giant Legion, Gamera is vulnerable to the swarming attacks of the smaller Legion. 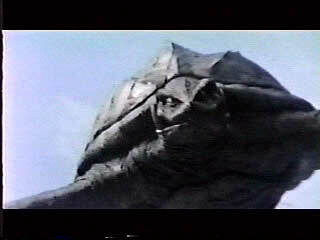 Thus Gamera and the military (who are naturally somewhat skittish at the thought of allying with a giant turtle monster) are able to fight off Earth's attackers together, Gamera by toasting giant Legion with fireballs, and the humans by finding the right electromagnetic frequency to attract the smaller creatures, thus turning a nearby broadcasting tower into a huge bug zapper. 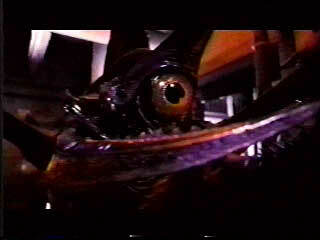 The mere fact that we could use the words "huge bug zapper" in our review is one of our reasons for loving Gamera 2. This movie is a kaiju film lover's dream, full of giant monster combat action, but it never forgets that the humans need to participate in the story too. 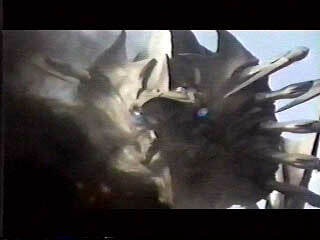 Kirin must have paid for product placement because Gamera destroys a Kirin billboard later in the film. Go back!